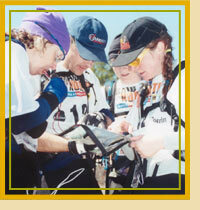 Preparing for Adventure Racing is much more than navigation and strategy. To take your AR to the next level, it is important to have the skills to keep you and your team moving and to stay in the race. We offer Adventure Racing Skills courses to help complete your AR Training, from discipline-specific courses like paddling, ropes and bike training, to Wilderness First Aid training to keep you and your team safe. Our AR Skills course instructors are dedicated to Adventure Racing, with years of experience either as competitors or as race staff, and will provide the tools you need to hone your skills. We have many courses under development, and will be announced shortly! Cost: $100 CDN for people only attending the course. NOTE: Additional sessions can be set up for groups in other locations. Contact our office for details. Please contact Shannon at AR Training (www.artraining.on.ca). You can reach her by e-mail: shannon@artraining.on.ca or by phone: 905-832-5250. All seminars presented by Rob Millar, High Performance Conditioning Coach and adventure racer. No matter what your racing experience, you will take away valuable information about how to plan your training year to efficiently maximize your sport-specific fitness while avoiding injuries and over training. This seminar will be predominately lecture format with opportunity for discussion and use of exercise equipment. We will first discuss how to be realistic in setting goals. Then, you will learn the basics of training progression and variation (periodization), and how to best build your training program. The role of resistance training is misunderstood by most endurance athletes. We will show adventure racing specific exercises using tubing, dumbbells and stability balls. Nutrition, rest and recovery are neglected to the detriment of performance; you will learn the tricks to optimizing recovery time through proper eating and well-timed rest. At the end of the seminar, you will have the tools to design a program for yourself based on proven principles. This seminar will expand upon the topics from Basic Conditioning for Adventure Racing. Periodization will be further explored and refined. You will learn how to organize your training week, even when time is tight, to maximize training adaptation while minimizing recovery time. Heart rate training can be a valuable tool with the right knowledge; but it can be misleading too. You will learn how to interpret your heart rate and exertion level so that you work in the proper training zone to develop adventure racing specific fitness. We will also discuss training errors that can sabotage your efforts. By the end of the seminar, you will have the ability to fine tune your training for high performance.